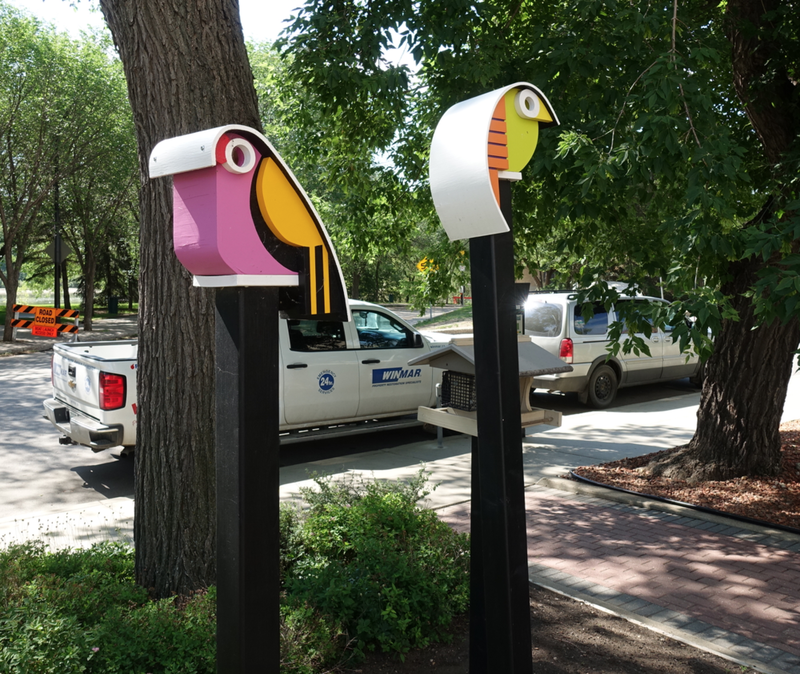 Postcards From Saskatoon: Public Art Capital of the Prairies? We recently spent an extended weekend in Saskatoon and were most impressed by the public art that was seemingly everywhere from street art to murals, from bike racks to art parks and lots in between. Check out these postcards and see if you agree! "Art imitates life" or is it the other way around. I love how these girls were inspired to climb and play with this piece by Saskatchewan artist William Epp titled "Tribute to Youth" created in 1989. Public art should engage the public. I was gobsmacked by this nine storey tall mural on the side of the First Nations Bank building in downtown Saskatoon. The mural was painted by Saskatchewan artist Emmanuel Jarus. I loved the tenderness that is depicted in such a large work. While the child is obviously of indigenous descent, the parents are more ambiguous which allows for different interpretations. Is it about new beginnings? Is it about the importance of family? Is is about love? Is it about dependence? Is it a contemporary interpretation of the "mother and child" image that has been part of painting history for centuries. I think it is also very fitting that the piece is on the side of the First Nations Bank building given its First Nation references. The red ribbon in the mother's hair is meant to commemorate missing and murdered Aboriginal women and girls. Note: The piece is part of the City of Saskatoon's Placemaker program for public art. It cost $15,000. Yes this is a real family from the Yellow Quill First Nation, 195 km east of Saskatoon. 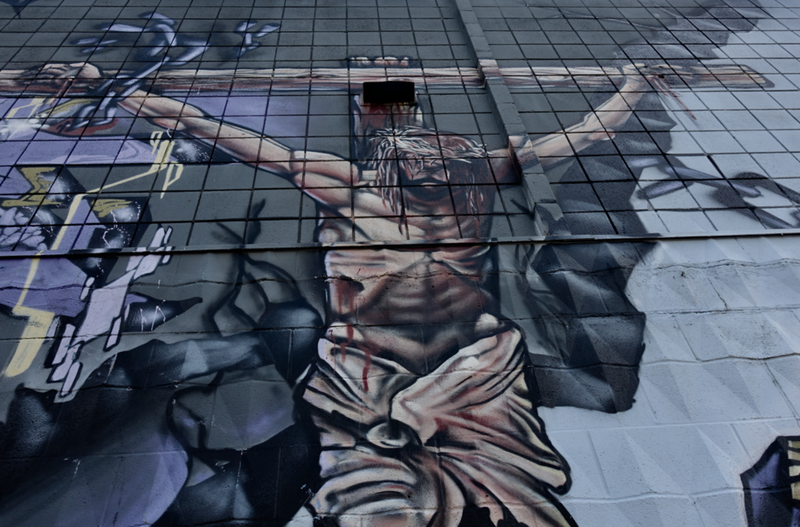 The City Centre Church mural in Riversdale also captured my attention. Too often street art is more decorative with little in the way of an artist's statement. In this case the imagery is very hard hitting, with references to the struggles of justice, alcohol and religion faced by indigenous people past and present. There is a very strong presence in Saskatoon of indigenous people are using contemporary art genres to express their plight. I loved clever hybridization of graffiti painting with realism in this mural. The impact of this mural is amplified by the fact the Ukrainian Orthodox Holy Trinity Cathedral is located across the street. Every city has a signature piece of art, in Saskatoon that is probably Doug Bentham's "Unfurl" located in the middle of a busy intersection at the west side of the University Bridge. One of the benchmarks of a good piece of art is that people still like it and are talking about it 10+ years later. In a recent Saskatoon StarPhoenix piece, Bentham notes people still stop and talk to him about the piece (yes, Bentham lives just outside of Saskatoon) and tell him how much they like the piece and how it changes with the weather. He was also quoted as saying "Unfurled" taught him "it's OK to consider the public when conceiving a sculpture." "Unfurled" is locate in the middle of an intersection, not exactly the best site for the public to view the artwork. I had to dodge a few cars to get to the base of the piece where the information panel is located. From this angle is looks a bit like a pelican which ironically are found in the Saskatchewan river just a few feet away. Move just a few feet and it looks like scissors and thread. I love ambiguous art that has reference to reality, but lets the viewer interpret the piece in infinite ways. Hidden away on the edge of the University of Saskatchewan campus is an artpark. Head to the Diefenbaker Centre (FYI the Centre's facade is in poor shape, and the plants next to his grave are all dead - shame on whoever is responsible) and then go towards the river and you will find an unmarked art park near the pathway. Public art should be made to climb on. Most of the art in UofS's sculpture park has no didactic information i.e. name of artist, title, date etc. It looks like anyone can just install their art here. While the grass has been cut, some whipper snippering around at the base of the pieces is badly needed. Turns out it is called the U of S sculpture garden and it was founded in 1993 as part of a sculpture symposium. It could also use some curatorial direction as some of the pieces look pretty amateurish. The University of Saskatchewan campus has public art scattered throughout the campus, however much of it has no information on who is the artist, title of the work or date. I later figured out this piece is by Eli Bornstein a famous local artist who has a studio on the banks of the Saskatchewan River just south of the city. The piece is located in front of the Synchroton Research building that studies sources of brilliant light. I thought it was by Ron Kostyniuk who was born in the small community of Wakaw, Saskatchewan, in 1941. He studied at the University of Saskatchewan in Saskatoon and later became an art professor at the University of Calgary where I met him when I was working at the Muttart Art Gallery. I loved these bollard that look like mini contemporary grain elevators. I love when art can also have a function i.e. pedestrian safety. When I first saw this I thought it was public art that referenced the animal traps of the fur traders who were responsible for the early exploration and settlement of the area. I also liked historical text. Later I learned they were bike racks. Bike rack or public art? If Joe Farfard designed a bike rack? Perhaps we should include children on public art juries. Every public art collection must have a huge animal in the middle of the sidewalk. This is the first musk ox sculpture I have seen. "Launch Time" is just one of many public art pieces along Saskatoon's River Walk in the downtown. These canoe-like fragments are a collaborate piece by Mel Bolen, Charley Farrero, Michael Hosaluk and Sean Whalley. Mural on the side of the mid-century modern Hudson's Bay department store that is now a condo. MOTA stands for Museum of Temporary Art (MoTA) that was initiated in 2012 by Jeff Nachitgall in the Riversdale neighbourhood. The works are created in a studio and then attached to the wall like they would be in an art gallery. He wanted to engage people who don't visit art galleries. I found about six MOTA pieces in the alleys and side streets of Riversdale. I definitely think this entrance could be considered to be public art. This sculpture, "Jump" by Brian Newman located behind City Hall would fit nicely into a children's playground. I loved these Picasso inspired folk art pieces. I loved them so much I tracked down the artist and brought home two - blog to follow. I found a few of these fun top hat cross walk figures. I love this kind of fun creativity. It reminded me of "Amplemannchen" a cartoon-like human figure used in West Germany traffic signals for walk and stop. Another reference to the fur trading industry? Found this mysterious fabric piece in the front yard of a modest home in the Nutana neighbourhood that could easily be that of an artist. I like the idea of utilizing the front yard as an outdoor gallery or studio space. I understand it is common practice to dress-up sculptures in Saskatoon. This one was dressed up for the Pride Parade. While Saskatoon might not have a public artwork by a world renowned artist, I think that works in their favour. Their public art is about Saskatoon by Saskatoonians. It isn't the ubiquitous public art you see in every North American city. It helps create a unique sense of place. I was told by a local that many of the new pieces are leased from the artist for a 3-year period and then returned to the artist. Public art doesn't have to be permanent art! Hmm....perhaps Calgary should have develop a "lease to buy" program for public art which would allow controversial pieces to be removed if they haven't gained public acceptance after three years. It seemed like there was public art or artifacts on every block of Saskatoon's city center, which is why I think Saskatoon could be called the "Public Art Capital of the Prairies." Do we really need all of this public art?